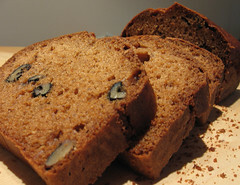 Château Banana Bread - Do You Know The Muffin Man? Notes: I found a very nearly identical recipe in the link above; the poster says it was obtained from the Queen Elizabeth Hotel in Montreal. My copy says Canadian Pacific Hotels (now Fairmont) and Château Laurier (I think) so it's likely from the hotel chain. This is an incredibly flavourful cake, with a rich deep brown colour that only comes from the long baking time at a low temperature. From the original 7 tsp baking soda on my copy, I've reduced it down to 5 tsp: the recipe in the link uses only 3 tsp. If you've ever been disappointed by a pale and ho-hum banana bread, try this recipe.